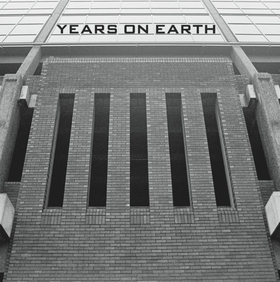 Years On Earth (Bob Roke & Mebz) have been active between 1979 -1984 producing three official tapes plus many hours of unreleased recordings. They hand built or modified most of their musical equipment and recorded in a deeply analogue way in their makeshift home studio. Their three official cassettes from 1980, 1981 and 1982 were very well received critically by reviewers in fanzines and the music press alike and they continued to develop musically and sonically; mixing found-sounds, synthesisers, drum machines, treated guitars, plaintive vocals and eventually even lo-fi (by today’s standards) sampling, coupled with quirky song structures that ranged from minimalistic to almost cinematic over the course of these three tapes. Stick It In Your Ear fanzine said at the time, “For a band to come along with something as sharp and original as this is indeed reason to celebrate”. The first three LP-sides of this set concentrate on each of the official tapes released. The fourth side is committed to previously unpublished recordings from between ‘79 and ‘84. The superb monochrome gatefold cover artwork is based on the original cassette inlays and compliments the music beautifully. This release is one of the most important and highly anticipated by Frank of VOD-Records as Years on Earth’s music helped him during his sleepless nights, suffering from a major tinnitus condition in 2007, by playing their tapes all the time. VOD had wanted to release their music for more than four years but no one seemed to know of there whereabouts. Then about one year ago Bob by chance contacted Frank as he wanted to inform him about the cassette reissues on Calypso Now from Switzerland and finally Frank was able to realise this project and bring together what belongs together.